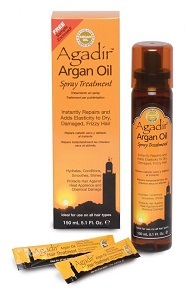 Leave in Agadir Spray Treatment is ideal for applying to longer hair lengths for ease in coverage, enabling protection from heat appliances and a smoother, comb through. Spray evenly on damp hair and style. After styling, spray lightly for a silky, shiny finish.